1:00 p.m. to 5:00 p.m. – Mon. thru Thurs. As a courtesy to all of our guests, you MUST Check-in during posted business hours. After Hours Check-in is not permissible. must register at the office. 3 Night Minimum required on Memorial Day, 4th of July, Labor Day, and Thanksgiving holiday periods. 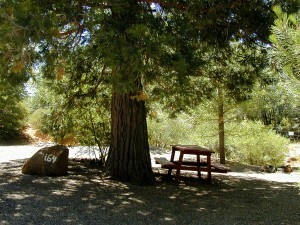 Camping reservations are made per vehicle by calling us at (760)765-0429 or emailing us a request. There is a maximum of one vehicle per campsite. A vehicle is defined as; a truck pulling a trailer, a motorhome towing a car, a truck, a car, a van, or 2 motorcycles. Buses require multiple campsites and are assigned campsites based on the maximum of 6 persons per campsite. Tents and RV’s may not occupy the same campsite. There is a maximum of 2 tents per campsite. There is a maximum of 6 persons and 3 dogs per campsite. Each vehicle entering the park must arrive during posted business hours. Each vehicle must have a reservation and each vehicle is assigned its’ own campsite. Parking vehicles offsite and transporting persons and gear in is not permitted. If a vehicle arrives at the park without a reservation it may be turned away due to lack of available space. A deposit guarantee of a basic one night stay must be made upon booking a camping reservation. We accept Visa, MasterCard, and Discover. Pinezanita RV Park and Campground is a pet friendly park and we want your pet to enjoy their stay with us as well! Pets are welcome as long as they are quiet, well behaved, and remain on a leash while outdoors. As a courtesy to all campers we ask that you please pick up after your pets. Currently, there are no restrictions on pet breeds. There is however, a restriction on the number of dogs per site which is a maximum of 2 per site.